Keui Tung to Blame for PNM’s Loss in ’95? Published on May 6, 2010 in Complaints, Elections, PNM, Politics and UNC. 5 Comments Tags: Basdeo Panday, Brian Keui Tung, Patrick Manning, Politics, T&T Govt. 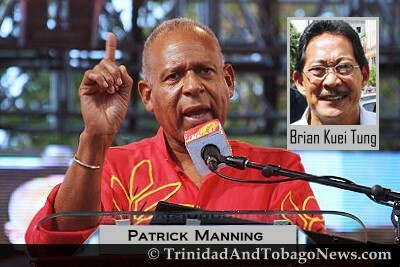 Prime Minister Patrick Manning last night fingered former UNC minister Brian Keui Tung as the person who sold out the date of the 1995 election to former Prime Minister Basdeo Panday.